Completely in love with all things in this photo. Inspiration in a nutshell by gorman. And, yes, I will be pairing a polka-dot socks with wedges this spring….obsessed! You think these looks are fabulous, well there’s more. Pinch me now because I think I’ve died and gone to heaven. This is true fashion fabulousness! I’m heading to Dallas this week for work and I’m terribly disappointed to be missing this Spring Event by Rare Trends. I only recently discovered this showroom when my good friend, Kristen of POM PR, was sporting a phenomenal fringed purse that I felt I must have and learned it was designed by Argentine designer, Allo Martinez, and was from Rare Trends showroom. Then only two days later, she was wearing a pair of earrings that took my breath away and again they were from Rare Trend. This prompted me to want to know more about this showroom. After looking into their designs and story further, I found they not only have beautiful accessories but also stunning clothing. Rare Trends was founded in September 2011 by sisters Paola Moore and Marina Silver who are originally from Argentina now based in Austin. I love that the sisters make a bold statement in saying “We believe women shouldn’t simply wear clothes. We believe women should wear art.” With this, they strive to seek designers globally who are different and modern and are “inspired by architecture, movement, and construction leading to garments that each tell a story.” I really admire this thought process that goes into discovering designers. The spring season is all about color, floral and prints. Three of my favorite things! They will be debuting new pieces from style-savvy Argentine designers: Jessica Trosman, Allo Martinez, Cosecha Vintage, Kostüme, Ana Silveyra, Natacha Morales, Tramando, Daniela Cortese, and Poty Hernandez. Oh, how I wish I were in town for this one. Here are two of my favorite looks and I can’t wait to see more. Orange Crush – pleats. LOVE! Green pant – color & pattern – great combo. If you’re local or around Austin on Wednesday, you should go to the event at the W Hotel to see more fabulous designs. We all know spring is all about color-blocking. In true form to loving all colored trends (or even all things colored when it’s not a trend), it seems I’ve developed quite a collection of colored jeans without even realizing it. Yikes! Pictured above I have blue & turquoise both from Nordstrom Junior department (Yes, I’m in my mid-30s and I shop in the juniors department). The green pair is from Express circa 2008 and then there is my newest investment, the boldest of all, the bright yellow jean from Forever 21 (again, yes, I’m in my mid-30s and tend to shop at Forever 21 ever so often). Believe it or not, I have another pair that’s not featured on this post. I think we can all say this is a true obsession (or better yet a “collection”)! Oh, regardless of my issue with obsessing over things, I love my colored jeans and will pair them up in lots of fun ways. The colored jean is a great way to spice up any ‘ol outfit. If you haven’t already done so, give it a go! I must say I’m kind of obsessed with this jewelry from Manic Trout. “Modern meets vintage chic”…LOVE IT! Since seeing their booth at the Texas Style Council Posh Party I can’t quit thinking of which piece I must invest in to pair with any and all outfits. I must say the critter line is my fave. Finally, the fab necklaces made from vintage scarves. To.Die.For! Really…you must check out her stuff. It will stick with you I promise! Soon I’ll feature cool Austin “street style” along with “personal style” photos with a decent camera but in the meantime, I love some of the “street style” spotted via iPhone at SXSW this past week. This is the fabulous Amy Cook. Not only does she have a phenomenal voice but also groovy style. I mean…does it get any better than this when it comes to “street style”. We were sitting at Perla’s enjoying a snack and I saw this girl walk by and had to run out of the restaurant to snap a picture. I discovered that she is the owner of the great shoe store, Boot Leg, operating out of an airstream (does it get any cooler than this). I was able to see Sarah a couple more times over the week and will feature her and her store on the blog next week. I thought everything about this girl was a-dorable. The print dress paired with the print bag sold me. This is “my style”. Maybe I was sold on this look because I’m obsessed with animal print (and tattoos for that matter) but I really loved the look of this chick….a rock-n-roll look. Ahhh…the classic vans (on my husband) and the neon Nike on our friend Igor of isssstudio…what a great combo. SXSW was such a great time this year. We saw band after band and hung with friends day after day but I must say I’m SO glad to be back to reality. It’s SXSW and the music is on this week! I was beyond thrilled to find out one of my favorite bands, Blitzen Trapper, will be playing eight shows during SXSW. I love these guys and will go see all eight shows if possible. We discovered Blitzen Trapper several years ago and I immediately loved the feel of the music. The band is from Portland and are considered an experimental country/folk band but in my opinion they are so much more than this. They have a unique sound I love along with phenomenal lyrics…I can listen to their albums over and over and over (and I do). My love for Blitzen Trapper went to a new level when we saw them live at the Utopia Fest this past September. Ever since, I can’t get enough of this band and will do everything I can to be front row joe at as many shows as possible this week. Here is a great video – Love The Way You Walk – and some pictures from our trip to Utopia back in September. Utopia Fest family trip. Yes, this is what we do with our free time…camp and watch music. No fancy hotels for this fam! Really, if you haven’t listened to this band, you should. Hope to see you at one of the shows! Spring does not “officially” arrive until March 20th but with the gorgeous weather we’re seeing in Austin this week for SXSW, everyone seems to be in full on spring attire. Yesterday as we were walking down South Congress, people were out and about wearing sandals/flip-flops, sundresses, sleeveless tops and shorts (Ummm…I must say…my legs aren’t quite ready to tackle the shorts yet…YIKES). This got me thinking about my spring wardrobe and what main pieces will take me through spring and summer. After perusing my closet, I’ve already found some trends that I’m sure to be sporting (bold floral patterns, yellow and neon to name a few) but the shoes in my closet aren’t looking too promising. Although I’m still not quite ready to give up my boots, I’m looking forward to busting out some wedges for spring/summer. With the key trend being all about bold colors, my wedges will follow suit. I’m kind of ob-sessed with the Jimmy Choo wedge up top but unfortunately they are a bit out of my price range. No fear though, here are some more options from one of my fave shops ModCloth. I seem to always drift to any and all Seychelles‘ shoes. Love this pair from ModCloth site. Such a fun color! How groovy is this wedge (also from ModCloth)! I absolutely can not wait to pair this one with all my colored jeans and bold floral dresses. Imagine this shoe with my bright yellow jean…to.die.for! Also, this spring/summer, don’t be afraid to throw not only bright color into the mix but pattern on the wedge. Great pair to consider from Anthropologie. I will be adding these to my “must have” list! Finally, I’m somewhat obsessed with animal print so will have to factor an “AP” shoe into my spring/summer attire. I love this pair by Sam Edelman. For the fall/winter, I had an animal print Sam Edelman boot which I paired with EVERYTHING! This wedge can add a great pop of funkiness to any outfit. There they are…the wedges I’m currently loving and wanting! Can’t wait to put some outfits together around these babies and post on the blog. The much anticipated SXSW has arrived! Since living in Austin, I look forward to this week every year. Typically, I’m only looking forward to the music portion of SXSW but this year I’m also participating in Texas Style Council which starts today. YAY! 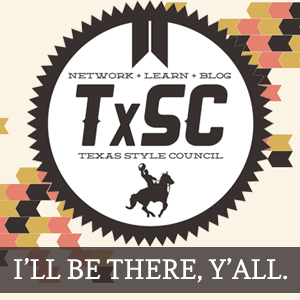 This is exactly why I started this blog and can’t wait to see what Texas Style Council has to offer. Now I just have to figure out what the heck I’m going to wear to all of the events…YIKES! Ladies, bow ties aren’t just for men anymore. I’ve been thinking about bow ties a lot lately. Wondering if I could/would be able to pull the look off. Unfortunately, I came to the conclusion that I just can’t pull it off so I LOVED when my fabulous sister-in-law, Molly, showed up to Austin a couple weekends ago with a bow tie on. Ahhh yes….I can always depend on Molly to bust out a totally groovy look and pull it off without missing a beat (more on Molly & her blog Smmidge to come). For now, since I’m not brave enough to pull off this look, I’ll live vicariously through Molly. Obsessed with the prints and colors of this look! Now here’s a bow tie look I think I could pull off. This week has been a crazy one which started Sunday as I had to drive to Dallas to gear up for a week full of meetings. Monday morning kicked off with me discovering I had misplaced my car key and my work clothes for the week were locked in the car. A locksmith saves the day, I got the clothes but still no key so my car remains in Dallas but I’ve now moved onto Houston for another series of meetings. Whew! Although it’s been a bit insane this week, the thought of the Radiohead concert tonight has kept me going. YES…tonight we will be at the Radiohead show. CAN.NOT.WAIT! I choose the “Fake Plastic Trees” video for the song of course but then the beauty of it too. The pops of color throughout the video, the totally groovy shirt on Thom Yorke and the fabulous styling. Hope to bring you some Radiohead concert “street style” tomorrow! I love print on print on print, bright colors, vintage & shoes. I tend to wear animal print in some way, shape or form multiple times a week. I love accessories (the more the merrier). Basically, I’m obsessed with all things bold. I also obsess about music and art. My “mantra” has always been “The Bolder the Better” when it comes to any and everything. This is my chance to show you all the things I obsess about daily and maybe it will one day lead to that boutique I yearn to have.